What you said about Endless Scream and Dauthi Mercenary makes sense. Even as I typed that up, I was thinking you might never get to the late game. But sometimes it's hard to tell just by looking at a deck. First, I feel like the inclusion of Infect might be dividing the focus of the deck, if ever so subtly. Several times in playtests, I'd have 2-3 creatures in play but only one with Phyresis, causing them to hit two different "life" totals (effectively). It was further complicated when I had a Rite of Consumption in hand, as it made sense to put the enchantment buffs on the Infect creature, but that also made the Rite pointless. So I tried focusing more on Infect, to ensure all creatures I controlled would deal Infect damage, but the only other pauper card that grants it is Tainted Strike . 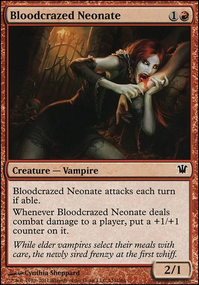 Also, sometimes I'd have only one creature but redundant sources of Infect (the only consolation being the +1 poison from Tainted Strike). 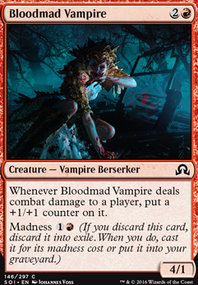 Ultimately, I just tried cutting Infect entirely and focusing solely on normal damage, which I personally preferred. Second, have you considered going with instant/sorcery buffs rather than enchantment buffs? Obviously, voltron can be very powerful when it works, but enchantment-based voltron is hurt a lot more by removal. You seemed to imply that you run into a lot of removal when you said "the opponent has probably removed enough creatures that it's almost impossible to get back into the game". 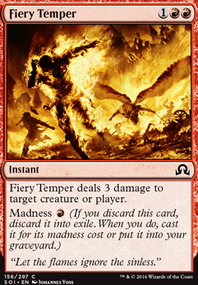 Going with instants and sorceries presents less optimal targets to your opponent, it usually gives you the same power boost for 1 less mana, and adding in a little card draw gives some resilience to the deck. Basically, you sacrifice a turn or two, but you also can keep the steam going a little longer. I playtested it quite a bit, as well as your original version. Although it can't get the turn 3 wins yours can, it will consistently win by turn 4-5. I'll keep my version up for a while, in case you want to play around with it a bit on T/O and see how it compares in your eyes. I removed Rite of Consumption as it no longer worked as well without permanent buffs. In its place I added card draw. I also never liked Skittering Skirge any time I had it in hand. It was always a disappointing play for me. 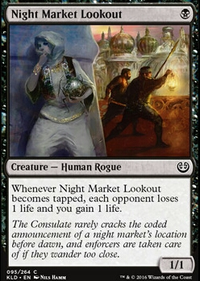 In its place, I tried several low-mana evasion creatures, like Guul Draz Vampire and Stronghold Confessor . I found that the former "auto-scales" better for both early- and mid-game, whereas the latter is only good on turn 4 if you actually cast it that turn. But they have different types of evasion, which may make a big difference. maybe Guul Draz Vampire over Falkenrath Gorger ? the evasion and power boosts might be worth the trade? 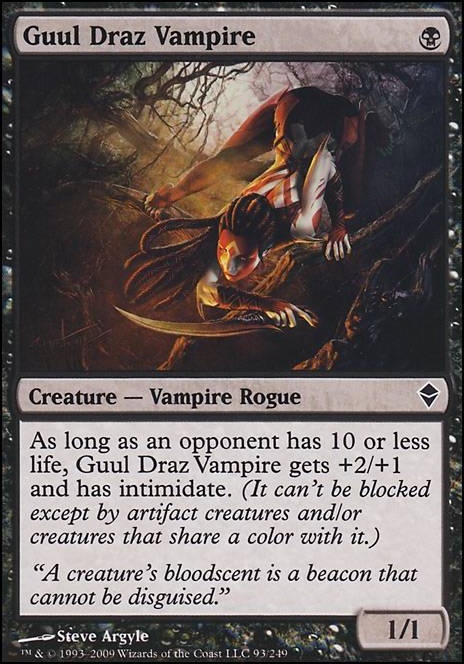 i suggest Vicious Conquistador , Guul Draz Vampire as aggro creatures too. 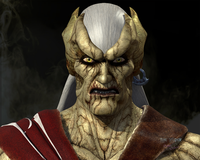 if u need another lord, to maybe reduce the Nocturnus slots too there' s Captivating Vampire . Sanctum Seeker could be a nice option too. 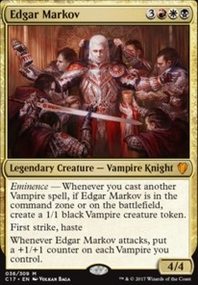 The most brutal way to build a Markov deck is to abuse his Eminence ability by playing as many low-cmc Vampires as possible. 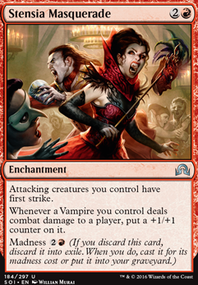 If you couple that with mana rocks and some Ramp you can drop a handful of 1cmc Vampires each turn and get free triggers for even more Vampires from Markov! This will also allow you to cut your lands down to around 30.